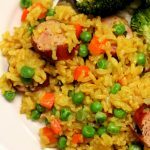 A quick, easy and healthy meal of seasoned brown rice with carrots, peas and chicken sausage. Turn your Instant Pot to the saute mode. Chop up your onion. When the display on the pot says HOT add in the butter and swirl it around until it is melted. Add in the onion and saute for about 3 minutes. Add in the brown rice and stir to coat the rice with the butter. Stir for about 1 minute. Add in the broth, salt, turmeric and garlic powder. Stir. Lay the sausage links on top of the rice. Turn off the saute setting. Cover the pot and secure the lid. Make sure valve is set to sealing. Set the manual/pressure cook time to 22 minutes on high pressure. Once the time is up let the pot sit there for 5-10 minutes (display will read L0:05) and then move the valve to venting. Open up the pot and carefully remove the sausage and place on a cutting board. Stir in the frozen peas and carrots. Put the lid back on and let the heat in the pot cook the vegetables for 5 minutes . Slice the sausage into quarter inch pieces and then stir them back into the rice. Scoop onto plates and serve. I served mine with roasted broccoli. I used long grain brown rice. You can probably use other types of rice for this recipe but I have not tried them myself. 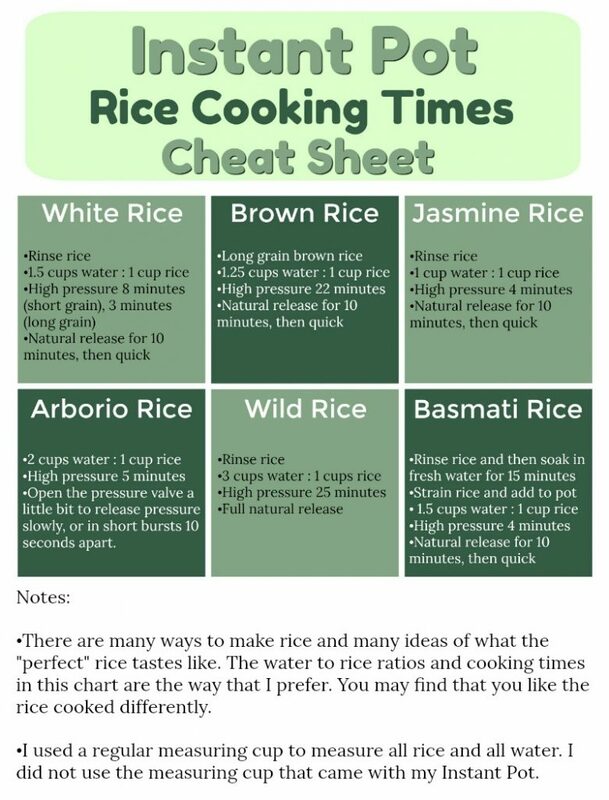 If you want to use other types of rice then use the rice chart to determine how long to cook and the ratio of rice to broth. I bought the spinach gruyere chicken sausage at Smith’s (Kroger) and I thought it was so tasty. There are lots of other brands and flavors that you can find at other stores too. This recipe is GLUTEN-FREE! Just check the chicken broth to be sure it does not contain gluten.